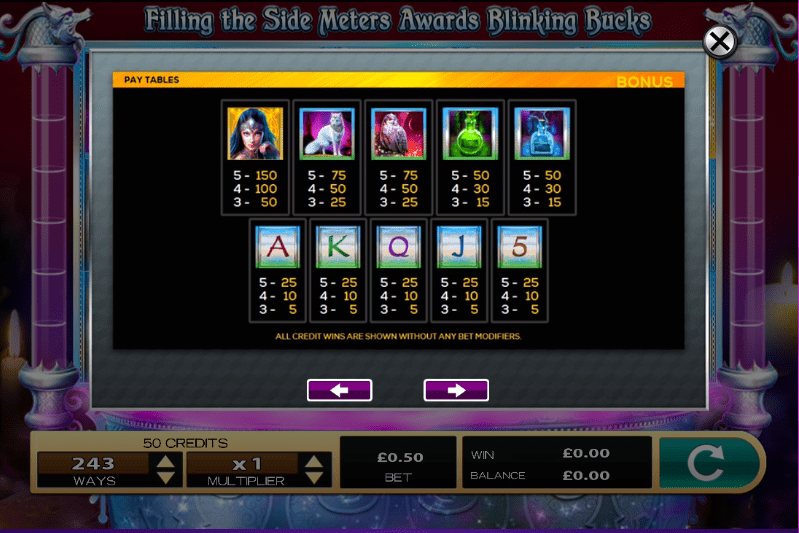 This is a slot game with an imaginary capturing fantasy theme, as Silver Enchantress brings a mystic, mysterious but beautiful slot game experience your way across 5 reels and 3 rows. A potion is being mixed here as you spin the reels on this well-animated slot game, where the Enchantress herself plays the role of the protagonist. Wizard Slots also has many other fun slot games here on our site. High 5 Games are the people behind this game, Silver Enchantress. It is they who have created such a well thought out narrative and character to lead the game. Their graphics are well polished for this title and the symbols and bonus features tie in well with the theme at hand. They have done well to make the overall gameplay very simple despite including a good amount of bonus features, too. A fairly new game and a fairly new name in the development of online video slot games, we can expect this title to be tweaked and improved over time but it is already a strong option. For other games from this developer, try your hand at Da Vinci Diamonds. Head to Wiz for more gambling and slots fun. As mentioned, this game packs in a lot of mystical flavours and a real feel of fantasy. The Enchantress is certainly enchanting, and this is thanks to some delicately created graphics and slick animations which really bring the slot to life. Playable across all of the usual slot game platforms - that is desktop, mobile and tablet - the graphics are optimised for all three and as such, so is the gameplay on offer here. Everything seems to flow well here and the narrative of the constantly mixing potion adds to this, too. The backdrop of this game is a spectacle in itself with a nighttime setting both feeling tranquil and unnerving as if something out of the ordinary is about to occur. Hopefully, on the purple-heavy backdrop, you are about to get some extraordinary wins and your luck on the 5 reels and 3 rows will dictate that. Lower paying symbols are represented by playing card symbols, whereas more theme relevant icons like a wise old owl with a crescent moon behind it and a green potion. Blinking Bucks, Racking Up Riches, and Jackpots act as the bonus features, triggered according to what is landed on these reels which are slightly covered by the purple smog that this game involves. Released in November 2018, this is a fairly new game but one that is already attracting some players and getting them some quite magical wins. These are in part mainly to the bonus features on offer, which act as nice refresher from the basic game mode which is fairly simple. 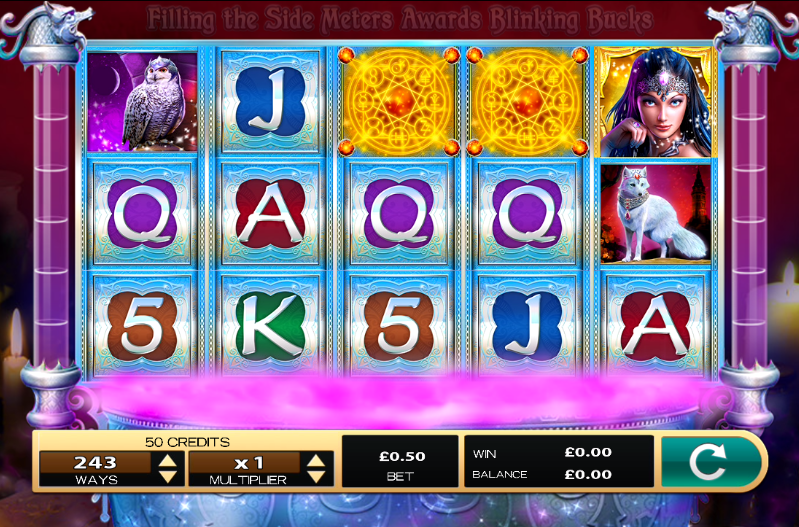 This is a really solid online video slot game, particularly if you like an element of fantasy in your slot games. Graphics are well delivered and there are plenty of features which create various ways to win. This will keep you on your toes and fully engaged as you play Silver Enchantress. If you enjoyed Silver Enchantress, Easy Slots recommends Wild Warriors!